In recent years, the markets (Mercados) of Madrid have once again taken center stage, bringing together the best of local and international cuisine. You can buy fruits and vegetables from small booths that come directly from family gardens, or experience a Michelin Star chef’s creation. We present you with some of the most famous markets in the capital, but don’t forget the less-known but still vibrant markets of Antón Martín, Vallehermoso, Chamartín and La Paz that also deserve mention. So, let’s go for tapas? It is the most emblematic market of the city. This is not surprising if we consider that it was built in 1912 and is the only market with a metal frame construction. Considered to be a Heritage of Cultural Interest, it is home to a great assortment of places where you can enjoy an afternoon tasting all kinds of gastronomy with tapas or go shopping for your daily groceries. Since its main objective is to provide the consumer with the best of the best, the produce is offered by the temporality and the season. For this reason, any time of the year is ideal to take a stroll through the bustling passageways. Its location, in the heart of Madrid, always guarantees a large crowd. 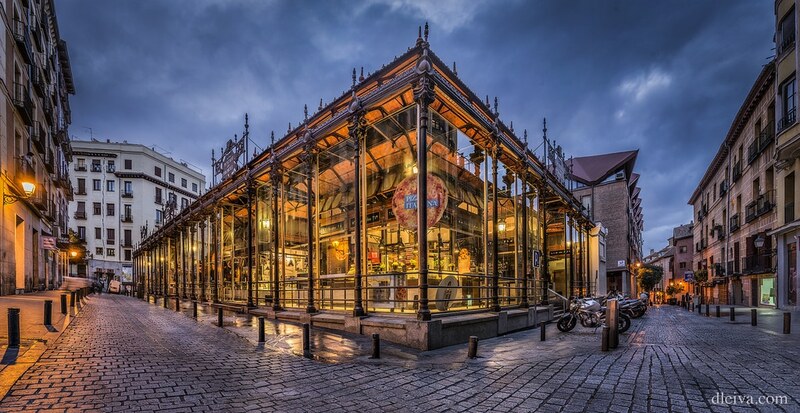 From artisan beers to tapas, we assure you that whatever you are looking for, you can find it in the Mercado de San Miguel. This gourmet space does not escape the memory of most foodies who find everything they could dream of on its three floors. You will not see produce stalls, since what this market mainly offers is already prepared food to eat in the multi-level part-inside part-terrace establishment. Eighteen stalls make up this ‘mercado’, accompanied by three bars and two garden-like terraces. Among them are Quesería de Mí, an essential stop for toast-lovers where several national and international concepts are created. Knowing the versatility of the egg, Granja Malasaña, is an exquisite site offering a variety of gastronomic traditions reinvented, with the egg playing the protagonist ingredient. And, of course, we can enjoy delicious tapas with an irresistible and modern presentation with the most traditional flavours from the hands of chef David Delgado. It is one of the last markets added to the capital located in the old Cinema Carlos III, in Plaza de Colón, which already has many fans. It has five floors, in which ‘booths’ of renowned chefs and gastronomic brands are located. The main point is to eat in the market, but you can also find take away options. You will discover about twenty places among which are directed by Michelin stars like Paco Roncero, Pepe Solla and Marcos Morán. At your disposal, in A Mordiscos, there are delicacies like sandwiches, toasts and salads; or if you prefer fritters, croquettes or a Spanish omelet, better to go to Castizo; or to eat a tasty meal with your hands, how about a hamburger or hot dog in Entrecortes; maybe your palate is more exquisite, some oysters or octopus in Batea; and when the cold arrives, a hot ‘spoon dish’ in Cuchara. Another element of this market is its impressive cocktail bar with formulas designed by the bartenders Diego Cabrera and Luca Anastasio. A true pleasure for all the senses. In addition, this immense space has the stage of the old cinema reserved for events, where sometimes they even hold live music. The market is dedicated to organic foods and promotes 100% healthy and environmentally friendly produce. What is especially surprising is its decoration. The environment is best described as a garden suspended on the ceiling, pots on all the walls and all the stalls filled with color. Here you will find deli, fruits, vegetables, baked goods and the opportunity to eat all these foods in the organic canteen of chef Javier Muñoz-Calero.